I told you two weeks ago about how I’m a party girl—link up parties, that is. I love these parties. I participate in quite a few, and I know that there are even more that I don’t crash. As fun as it would be to party it up like a blog rock star, I have to limit my craziness just a bit. I’m a follower of every blog that I party at. And being a follower is a big deal for me. It means I actually read just about every post that blogger puts out there. I click on so many of the posts other partiers link up. And it takes a lot of time. It’s an investment, really. And while I have a link up party page that will send you to the sites that I party at, and I’ve just changed my blog layout so all their buttons are on my sidebar as well, I thought I’d give a bigger shout out to each of these hosts. 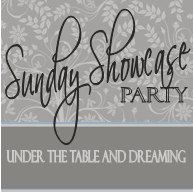 This week I’d like to tell you about why I like The Sunday Showcase Party at Under the Table and Dreaming by Stephanie Lynn. And this project made me wish I had a bay window. She did a tutorial on how to make a curtain rod fitted to your window. And just a few days after seeing this, Hooked on Houses did a post on Jennifer Lopez’s new house and how she decorated it. She has a bay window with a rod that looks just like Stephanie Lynn’s! Not only does Stephanie Lynn have a good eye for decorating and an amazing creative ability, but she also knows how to spot a special something. She features some fabulous projects from other bloggers. Her party starts on Saturday evenings. Thanks, Stephanie Lynn, for being such a great host!